Are you curious why Montana has 38 craft breweries? Want to know how Montana is tied to Pabst Blue Ribbon? Do you know where the most remote brewery in the country is? Read the book already! Montana’s brewing history stretches back more than 150 years to the state’s days as a territory. But the art of brewing in Montana has come a long way since the frontier era. Today, nearly 40 craft breweries span the Treasure State, and the quality of their output rivals the best craft beer produced anywhere in the country. Maybe it’s because there’s also a little piece of Montana in every glass, as the state’s brewers pride themselves on using cold mountain water and locally sourced barley harvested from Montana’s ample fields. 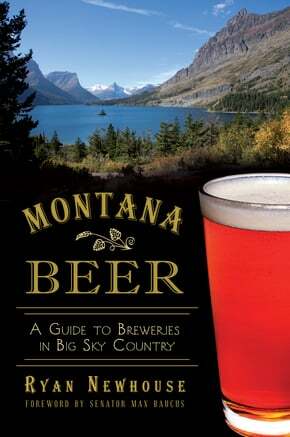 From grain to glass, Montana Beer: A Guide to Breweries in Big Sky Country tells the story of the brewers and breweries that make the Treasure State’s brew so special. Ryan Newhouse tells the story. Newhouse moved to Montana in 2002 for graduate school and has yet to find a reason to leave. He works as a full-time freelance writer, covering a wide variety of subjects, but he always prefers writing about beer. This is his first book. In his free time, he helps raise his two children and explores the woods, rivers and mountains as often as possible. Newhouse has nurtured his appreciation for craft beer one glass at a time and sometimes he falls in love with a style more than once. He writes for several beer blogs, including his own, MontanaBeerFinder.com. He is a co-founder of Missoula Craft Beer Week, and he thinks his German heritage has a lot to do with his admiration for beer. But we suggest you find out about Newhouse and Montana craft beer for yourself. Purchase this excellent non-fiction work right over here.